Valid concerns, but nothing that you already don't know. Myopic, narrow & shallow. Blah! Blah! 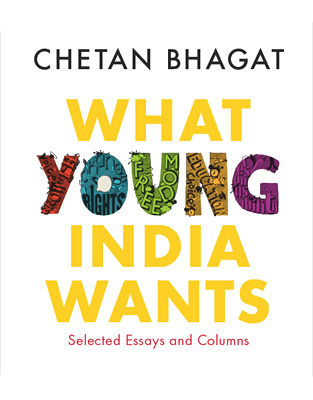 ‘What Young India Wants’ – bold title for the first non-fiction book by a bubblegum-lit writer – Chetan Bhagat. The book is a collection of essays and columns, which he’s been writing for popular newspapers. The book raises very valid points and problems: corruption, lack of trust and human values, corruption, problems with education system, corruption, problem with economy, etc. He makes sense when he says that the two things that won’t work are: ‘Chalta hai‘ and blame-it-on-the-netas attitude. His argument against reservation based on religion, state & quality of education are well put. His speech titled ‘Sparks’ was good as well. And that’s about it. But his solutions to these problems are myopic, analysis of them is shallow & random and analogies are stupid. Changing times call for different solutions than past. You can’t rely on past for answers to new problems. What we have might be a mess of mixed morals, but Indian values – whatever they mean – is too vague & lazy a thing to say. Mr. Bhagat fails to understand the vastness of the country he is talking about. 100% agreement on anything is not possible. Especially when it comes to something like values and morals. Even though he worked at an investment bank; he uses wealth and money interchangeably – as if they are the same thing. Mr. Bhagat suggests we tell politicians to stop being corrupt by telling them – you will have money; you won’t have Laxmi (his word for money earned by good means). Well Mr. Bhagat I am sure they are dying to have Laxmi. Parliament should adopt the Janlokpal because – confidence. Parallel he draws? The notes that we carry in our pocket have the value we perceive. WHAT?! Mr. Bhagat, during his childhood, decided to commit suicide because no one loved him and he scored bad in Chemistry exam. He bought Copper sulphate. Why is he still alive? Because a dog who was also not loved didn’t go and buy Copper sulphate. Most of his solutions are: throw more money at it, throw more colleges at it, throw more resources at it and if nothing else – throw more morals at it. Mr. Bhagat loves America. According to him, they are materialistic, workaholics etc. but he loves them – they get everything right. I am sure that Jazzminator from Amreekandesi would agree. He is often sexists and stereotyping rampant in the book. I am very sure he fails to see it. To me, he doesn’t come across as a well-read, well-traveled or deep writer / thinker. One might argue that it is intended for an audience who is just coming out to senses and realising what is happening. But these problems are not something you suddenly see, they are there from the very childhood of almost every Indian. And even are some people who are waking up now; I wouldn’t give them such narrow, unrealistic and childish perspective of things. This book doesn’t belong to the youth, they know what they want better than this book. And this book, in no way, is of any help to whoever is looking for solutions. Of Duck and Crocodiles is a fable that is plain stupid. Someone was trying to write very smart. The Cut-off, on the other hand, was his signature style narrative and was very well done. Writing style is bad, distracting and immature – to say the least. Like American Dream, I have an Indian Dream. This book is not perfect, I am not expert. Sorry to waste your time and money so I could tell you what I think Young India wants. I don’t now what it wants. Well then bloody don’t write a book about it. PS: Rachita Rakyan did a very good job with the book cover. It’s typeset well for the content type – short essays. Published on August 8, 2013. Updated on December 27, 2013.